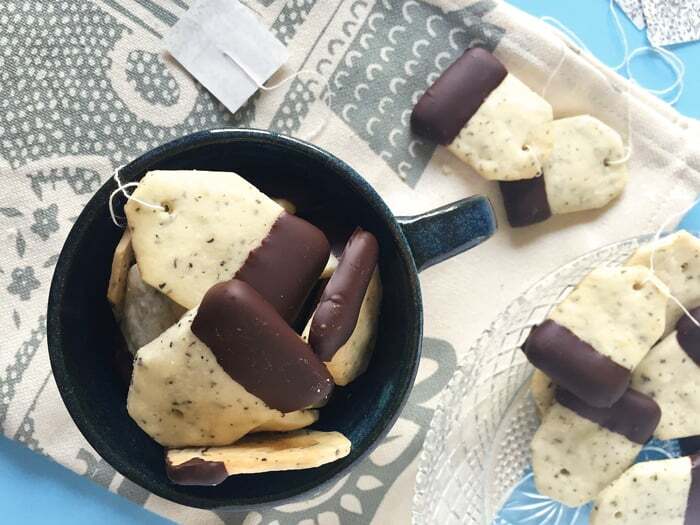 Earl Grey Shortbread Cookies shaped like tea bags and dipped in dark chocolate make for a show-stopping teatime cookie! Here’s something you might not know about me: I took ballet for 12 years. From a young age, I dreamed about twirling as the sugar plum fairy and dancing in Swan Lake and wearing the fanciest, flounciest tutus. As I got older, I found I was interested in 500 million other things, much as I am now. Back then it was art class and reading Nancy Drew books. I always used to bring a book to rehearsal, and I often got in trouble for not paying attention! I ended up quitting ballet when I was 15. I wasn’t getting the parts I wanted (getting cast as a party boy in The Nutcracker was the beginning of the end for me) and, to top it off, I injured my knees, probably from starting on pointe shoes too early. I would have needed surgery and a lot of hard work to turn ballet into my career, and I just didn’t want it enough. And, like I said, I was interested in a lot of other things. But I can’t deny that ballet was a huge part of my childhood. My mom made me these amazing scrapbooks filled with pictures of me from ages 2 to 15 in tutus of all colors. There are also programs from all my recitals and shows, sweet cards from my grandmothers and other mementos like drawings the other girls and I made for each other during our dress rehearsals. We often used to give each other ‘good luck’ gifts, too. One of my favorite such gifts I received when I was 10 and performing in that year’s spring production of Alice in Wonderland. My blonde friend got to play the part of ‘Little Alice,’ the one after she eats the cookie! I was so jealous of her, but I was cast as a butterfly and it was equally awesome. Despite my jealousy, on the eve of opening night, she handed me a gift, which I still have — a hardback copy of Lewis Carroll’s Alice in Wonderland & Through the Looking Glass. Alice had always been a favorite Disney movie of mine. I even had an Mad Hatter–themed tea party when I was a kid. So when ‘Little Alice’ gave me a copy of the book, I devoured it as I did Nancy Drew. Carroll’s whimsical land, his plays on words and his bizarre characters became some of the literary moments I cherish most. I’m less of a bookworm these days, but I still love any and all things Alice. This weekend the movie Alice Through the Looking Glass opens, and I’m looking forward to seeing it. I find it so interesting to see how different people — from my former ballet teacher to Tim Burton — adapt and build upon the story and characters I love so much. I have a small collection of Alice books (next on the list is Anna Rifle Bond’s adorable illustrated edition) and I always see every Alice movie, from the traditional and weird. P.S. 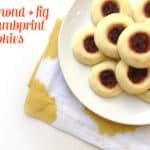 You should pair these cookies with a cup of tea! 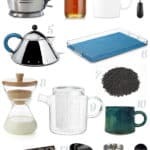 Learn a bit about drinking tea and the essentials you need to do it well. This Russian Tea is a family favorite. And of course, you can always make it a cocktail. This Peach Tea Old-Fashioned is perfect for summer! 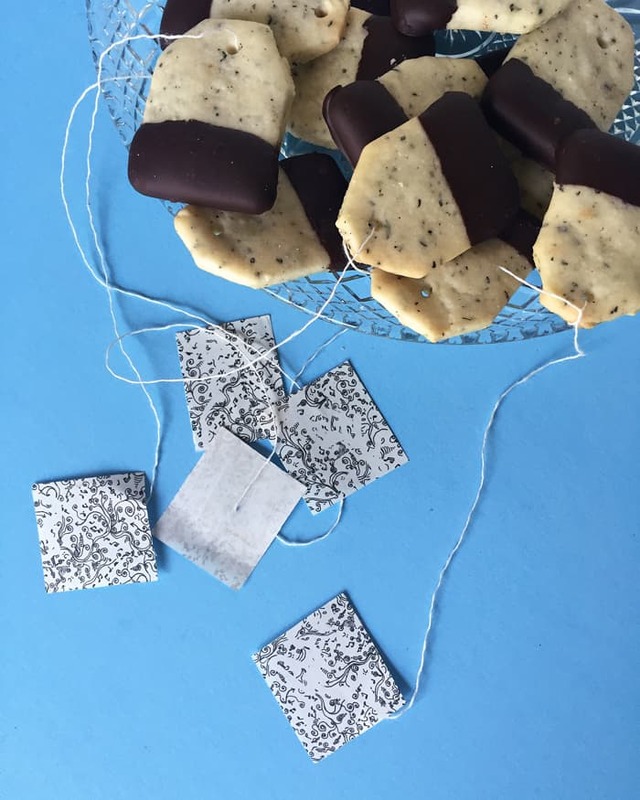 Earl Grey Shortbread Cookies shaped like tea bags and dipped in dark chocolate make for a show-stopping tea party cookie! Prepare 2 baking sheets by lining them with parchment paper. In the bowl of a mixer, beat the butter until pale and fluffy, about 4-5 minutes, scraping down the sides of the bowl as needed. Add sugar and continue to beat for 2 more minutes. Beat in vanilla. Add flour mixture and tea on low speed, scraping down the sides of the bowl as needed, until dough is barely sticky. Form the dough into two equally sized balls. Wrap each in plastic wrap and flatten gently into a disk. Refrigerate until firm, about 1 hour or more. Preheat oven to 350°F. Onto a floured surface, roll out one of the disks into a 1/4-inch thickness. 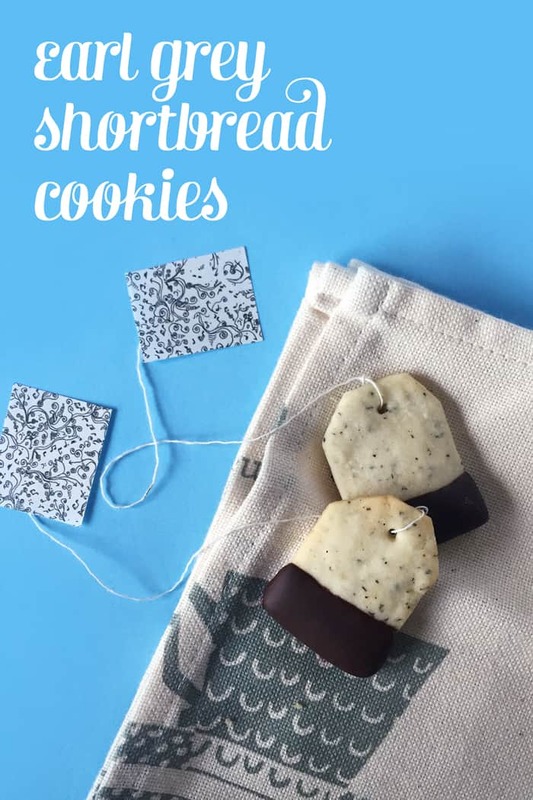 Cut out tea bag shapes with a rectangular cookie cutter or knife. Trim off off two adjacent corners. Poke a hole in the dough with a skewer or toothpick. Transfer to prepared baking sheets. Re-roll any scraps and repeat with remaining disk. Refrigerate cookies until firm, about 30 minutes, so they retain their shape while baking. Bake until firm and golden, 10 to 15 minutes. Let cool completely on a wire rack. Line a baking sheet with wax paper. In a heat-proof bowl, melt the chocolate chips in the microwave. (You can also use a double-boiler on the stove.) 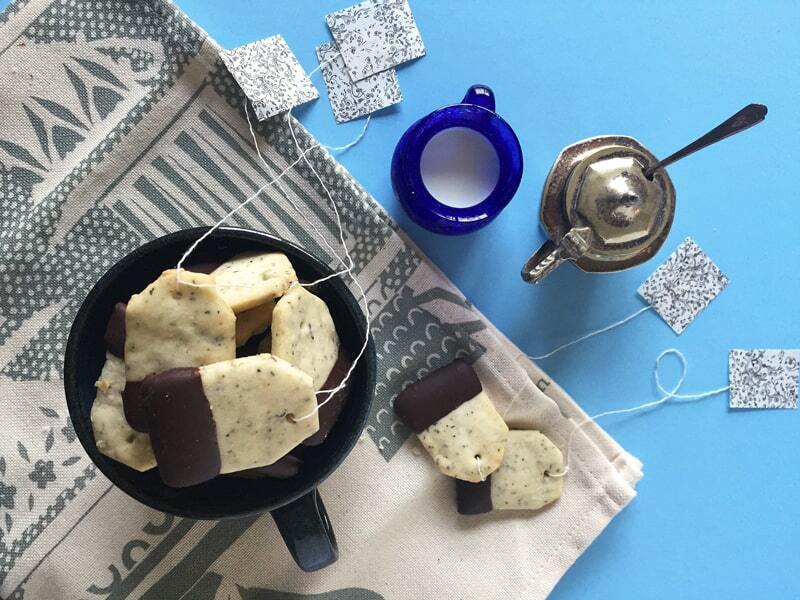 Dip the bottom third (the side without cut corners) of each cookie into the chocolate to resemble a tea bag. Place on wax paper. Refrigerate until hardened, about 20 minutes. If desired, tie on thick thread. 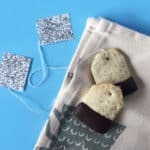 Attach the other end of the string to 1.5-inch squares of cut paper to resemble a tea bag. 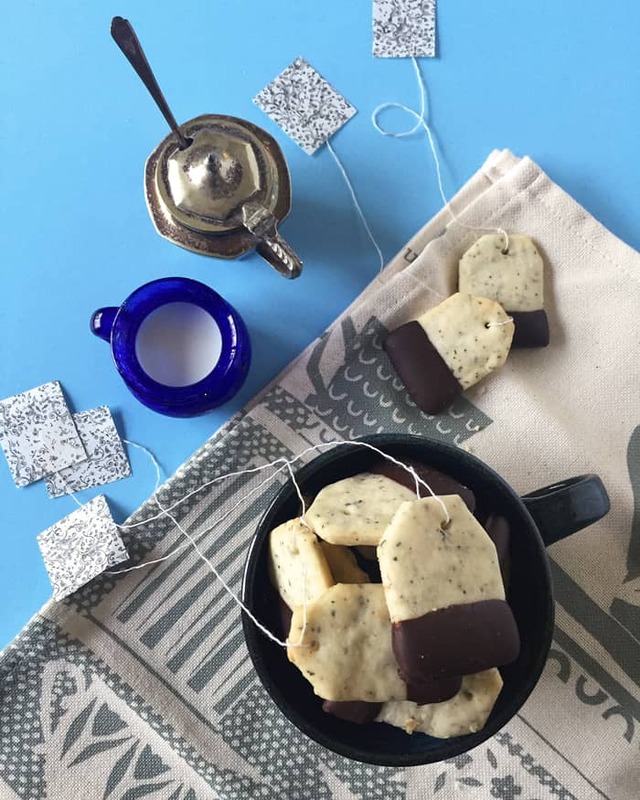 This recipe was inspired by these gorgeous tea bag cookies from Sandra Kavital. 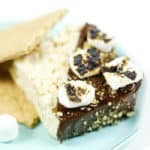 The cookie dough is loosely based on Martha Stewart’s Shortbread Cookies recipe. P.S. The blue mugs are by Erika Gibson and the tea towel is by Skinny Laminx! A few bloggers get together each month to share recipe and craft inspiration inspired by a newly released movie. 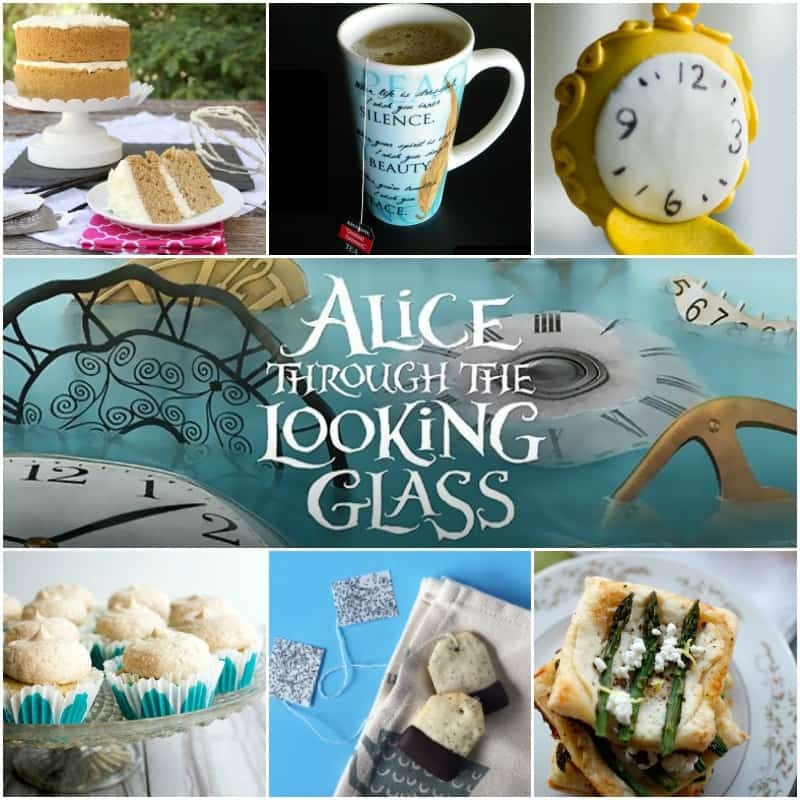 Check out all of the Alice Through The Looking Glass posts below — would be so fun for a tea party for kids or adults! Ahh these are too cute! 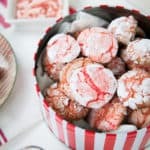 I want to throw a tea party just so I can make these cookies. My favorite cookie and my favorite tea! You’ve piqued my interest. Thanks Janice! I love a big cup of Earl Grey tea too! I had NO IDEA that you were a ballet dancer for so long! That’s crazy and so cool! And these cookies? Mmm. Yes, please. I haven’t been big on tea until recently, so I can imagine this combination of flavors… and that chocolate… makes these cookies divine. Nice work, friend! 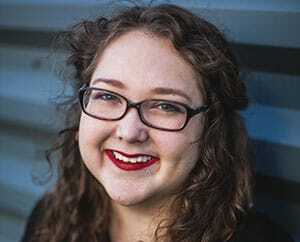 Hi Susannah! These cookies look amazing. I thought you might want to know that your pins have an error when I tried to click through them to your blog. There just might be a URL error or something. I just thought you might want to know. Have a great week!